Some in depth reviews of Cariboo Blades knives, tools and customer testimonials. Please read these reviews and follow the link to some of the testimonials from customers. One late night I was searching for mountain man style knife makers and somehow stumbled on the caribooblades.com site. I looked at the knives in the catalog and as usual did not immediately spot the design combination I had been looking for so long to find. However, the site suggested they would make or design any knife if you wanted something special. After seeing the quality of the work I could expect from Scott and Aki, I explored the available designs on their catalog page. I decided this would be the time to invest in an additional commission for any knife available from Cariboo Blades that I might now or for that matter might ever have use. I subsequently chose 3 additional designs from those listed in their catalog. 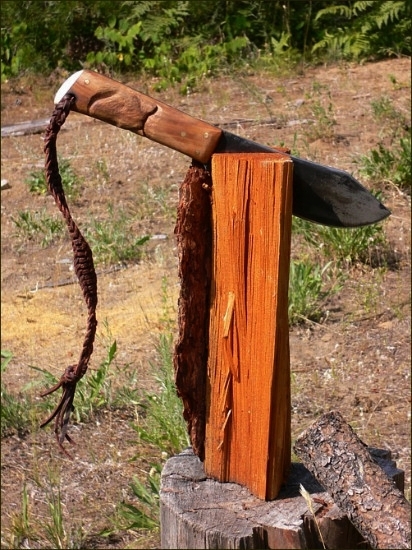 There are about as many opinions of what makes a “good” knife as there are people who use them, especially if those people have any real bushcraft experience. If you research camping in the old style of E. Kreps, Daniel Carter Beard, Warren H. Miller, Horace Kephart or George W. Sears “Nessmuk” or the like, you will come to know that the three most indispensable pieces of equipment in their opinion were the knife, the compass and matches. 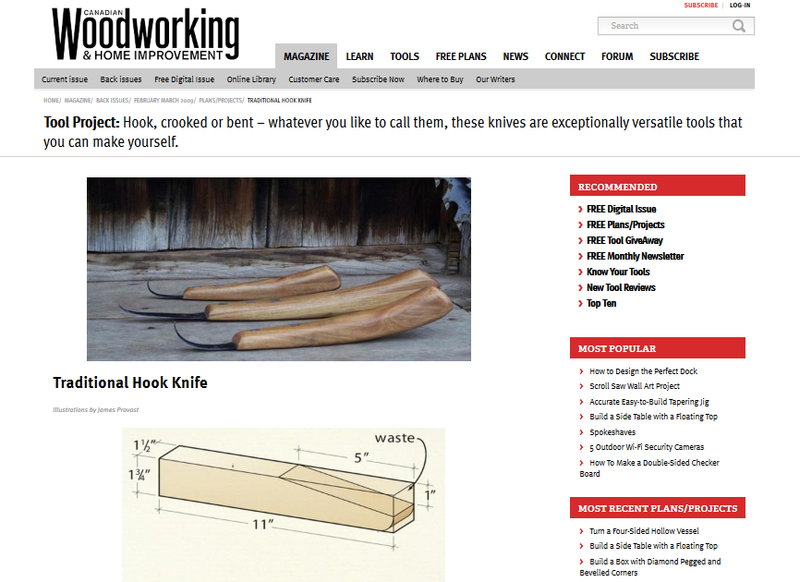 Woodworking Magazine on making a crooked knife. I have always been puzzled by these tools and hadn't had much interest in them, but your article was so well written and illustrated I just had to try making my own. I can't begin to tell you how happy I am with my new cleaver. I did receive the cleaver in time for the bbq and it stole the attention of all who attended (no small feat considering the 16 hr smoked local grass fed beef briskets and the 12 hr smoked Berkshire pork shoulders). I’ve got several larger knives, but my current favorite is probably the Mountain Caribou knife made by Cariboo Blades. It has a blade that is a hair over 6 inches in length, about a quarter inch thick. It’s a beautiful, hand made tool, but it is made for hard duty. Aki Yamamoto’s solo show of carving reliefs and wood block prints, “A Forest Falls”. The upstairs exhibit space at the Station House Gallery is hosting a unique solo art show of pieces created by Aki Yamamoto during May. Please view some customer testimonials.